A body is wheeled into an ambulance as Annalise returns in haste to her house, which is on fire. She insists to see who the dead body is, and breaks down after she does. Wes is interrogated for the murder he just witnessed. Annalise comes to pick him up in New York and asks what Frank, who apparently drove him there, told him. She speculates that he took him there on purpose so he can shoot Mahoney to make it up for what happened to her in the past. And then he disappears. 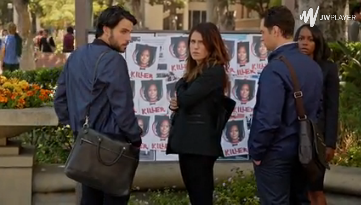 Four months later, the Keating 5 are back at school for Annalise’s Criminal Law Legal Clinic, but they are all lagging behind as far as their grades are concerned. 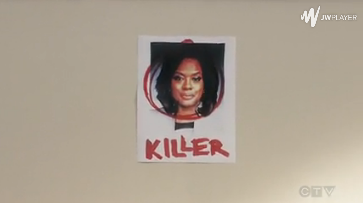 She finds a flyer on the wall with her face on it, captioned “Killer”. The next day, she sees more posted around campus. She keeps a secret mobile phone under her jewelry box to get in touch with a hitman who is trailing Frank. Once he lets her know that he has found him, Frank sneaks up from behind and slits his throat. Wes has a new girlfriend. Oliver breaks up with Connor. That was a slow start for the new season after everything that happened in Season 2. It feels like everyone is in on the secret, but they are also treading on thin ice, as if they could no longer process who to trust and who not to. It’s ambiguous like that. The flashbacks of Annalise reaching out to each of the five appear to be strengthening her new role as their “mother”. The way I see it, though, she still plays the role of the babysitter cleaning up everyone’s mess. The big question for the season is who that body in the ambulance is. Who can probably die for Mama Annalise to break down like that? We can theorize that it’s either her real mother or Nate, although it seems too contrived for Ophelia Harkness to be visiting and at the house alone at the time of the fire. If it’s Nate, then what is he doing there when Annalise wasn’t there in the first place? I think they already resolved all their issues, right? It must be one of the five then, but would they go as far as kill one of the five we’ve been following for three seasons now?